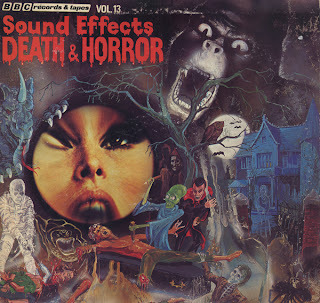 Unlike many sound effects records made for halloween which are generally "soundtracks" complied from "horror" effects, this LP delivers single effects which makes this record great for sampling, and not-so-great for entertainment at a party. Some of the effects are "cheesy" and some have a creepy depth to them. Oh, and there's the great garish cover which should make any collector happy. 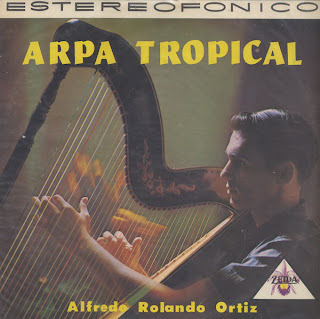 Excellent somewhat exotica sounding Latin album manufactured in Columbia. The music is unique and great fun. 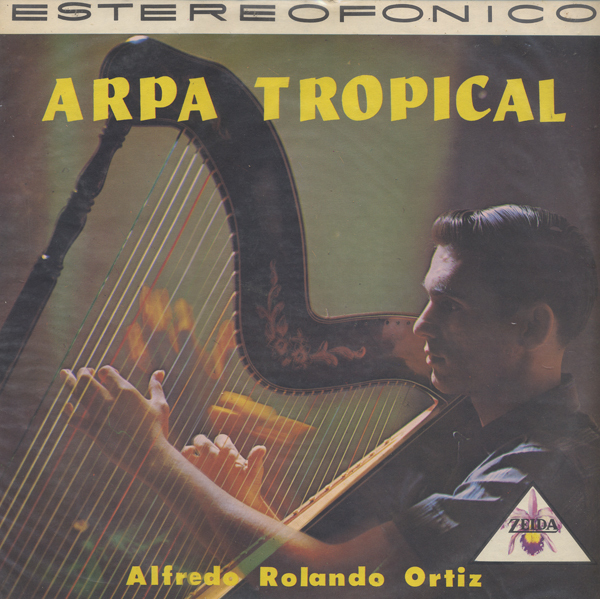 Ortiz has recorded over forty albums and continues to work. Many songs are available for download. There is a brief jacket note in English which states that: The music on this disc is Swabian in Character. 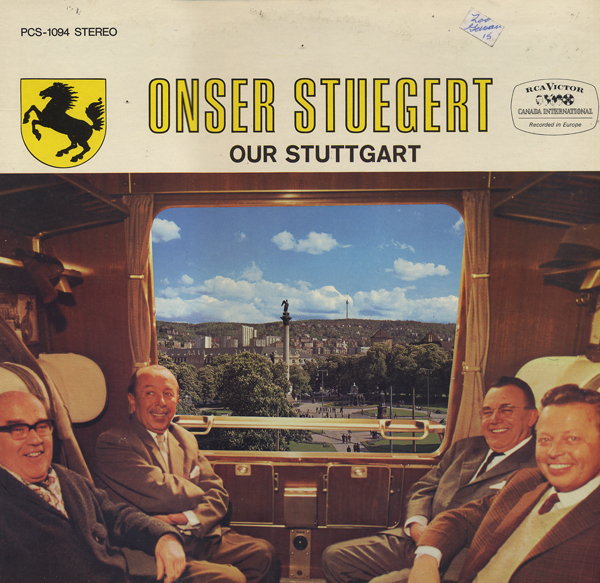 The tunes refer to local landmarks in and around Stuttgart. Some of them are contemporary, like "On The Television Tower (Am Fernsehturm). I think that you can see the television tower through the window in the cover illustration. 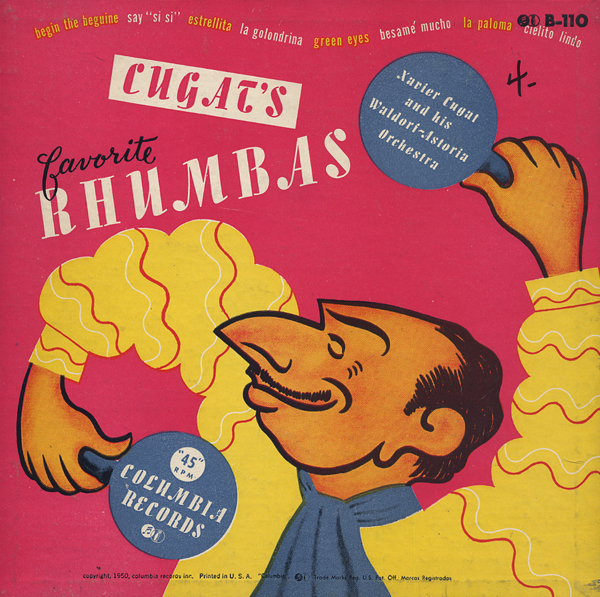 A three record 45 rpm boxed set featuring a nice surrealist painting on the cover. 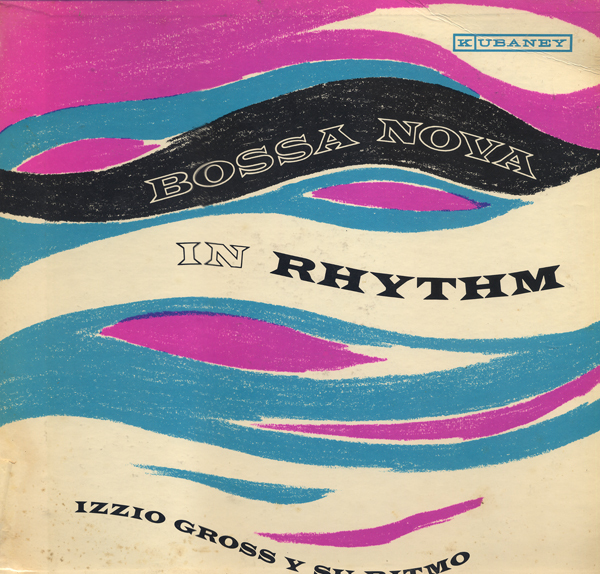 From the back cover: Through his unique instrumentation and inspired arrangements, he has not only freed jazz from the strict tempos and traditional restrictions of the dance hall, but has actually succeed in creating whole new rhythms and sounds in music. 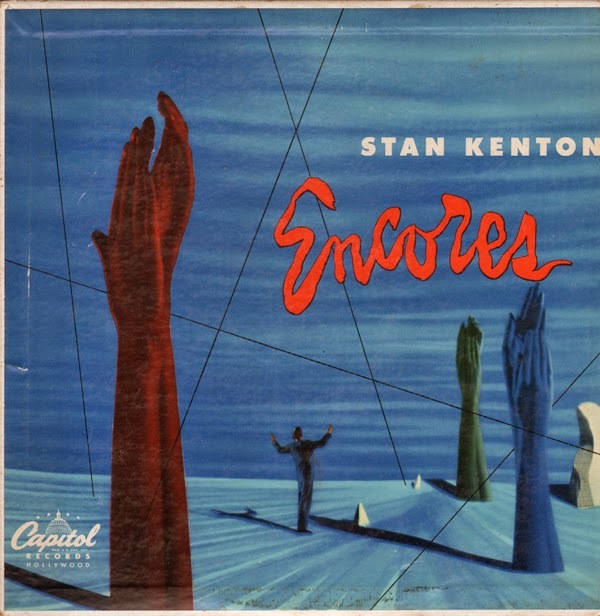 His fabulously successful concert tours from Carnegie Hall to The Hollywood Bowl have given hundreds of thousands the pleasure and thrill of discovering Kenton's "progressive jazz" at first hand. This is the cover and one of 4 sleeved records in this Columbia 45 rpm box set. 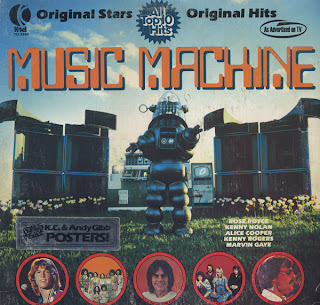 This K-tell record features Robbie The Robot. Robbie first appeared in my all time favorite science fiction movie, Forbidden Planet (1956). To this day, Robbie, next to the robot from the television series, Lost In Space (Robot B9), is the best known of all movie robots. I highly recommend buying a copy of Forbidden Planet. The special effects are stellar, the art direction is amazing and the soundtrack, experimental and still sounds other worldly. Terrific cover on this somewhat hard to find Coronet pressing. 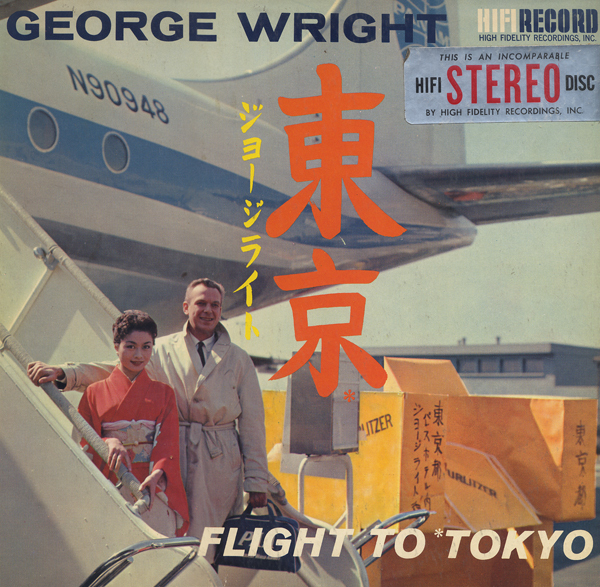 This is an obscure album, label and singer. I expected to hear recycled material on this album. But Johnny Kay is an amazing professional crooner. Notes from the back cover suggests that Kay's voice is "similar" to another popular singer. "You recognize the similarity once you've heard a few of the songs from this album." That's pretty amazing marketing if you ask me and must have pissed Johnny off. The notes must refer to Dean Martin. At least that's the name that comes to my mind. Correct me if I'm wrong. I wonder if being compared to Martin was enough to ruin this guy's chances or something else happened to him? Also, I wonder why they didn't promote his image on the album jacket? Maybe he was blessed with pipes but not looks? There is very little information to be found online. 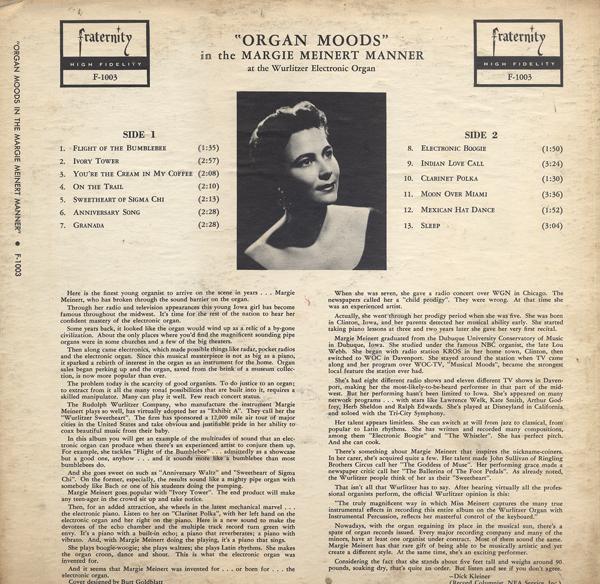 The back cover is loaded with 30 images of the Kristal album catalog. Apparently Izzio Gross was a pianist as the piano is the featured instrument on the record. 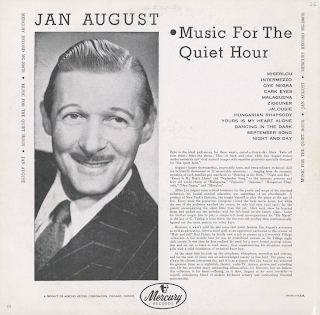 From the back cover: Altho Jan August rates critical hosannas for the purity and scope of his classical technique, his formal musical education was something of an afterthought. A product of New York's Eastside, Jan taught himself to play the piano at the age of five. Every week the precocious youngster visited the local movie houses, but while the rest of the audience watched the screen, he only had eyes (and ears) for the pianist accompanying the silent films from the pit. After each show he hurried home and picked out the melodies with his left hand on the family piano. Later his brother taught him to play a simple left hand accompaniment for "Oh Marie" in the key of C. Taking it from there, the five-year-old prodigy then mathematically figured out the same pattern from other keys. 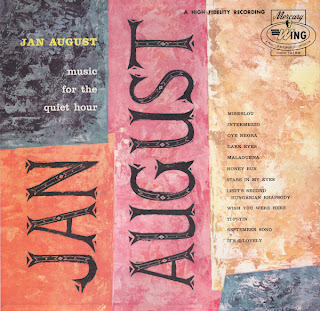 However, it wasn't until his late teens that music became Jan August's avocation as well as advocation. After a brief spell as an apprentice cartoonist to the creator of "Mutt and Jeff" Bud Fisher, he finally took a job as pianist in a Greenwich Village restaurant. A few months later he was as established success on the Village night club circuit. It was then he first realized his need for a more formal musical education and set out to learn to read music; thus supplementing his abundant natural gifts with a solid foundation of technical know-now. At the same time he took up the xylophone, vibraphone, accordion and solovox and for the next 12 years as an acknowledged master in that field. 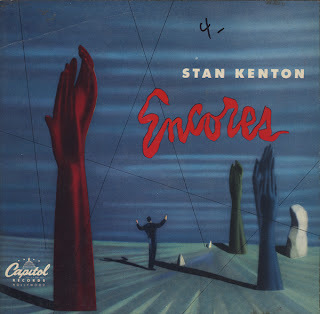 The piano was always his chosen instrument tho, and it is as a pianist that Jan August has achieved his greatest fame as a nightclub, theater, radio-TV, motion picture and recording star. 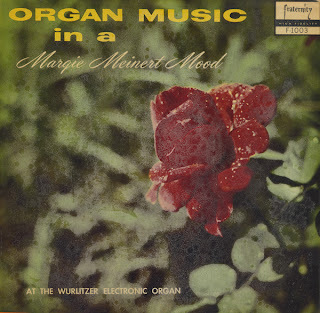 Meinert was contracted by The Rudolph Wurlitzer company to tour, promoting their new electronic organ. Wurlitzer was also located in Cincinnati. 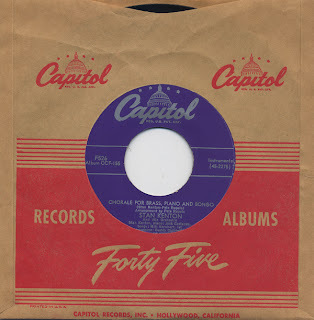 They contracted with Meinert in 1955 according to Billboard. From the back cover: ...she's an exciting performer. Considering that fact that she stands about five feet tall and weighs around 90 pounds soaking dry, that's quite an order. Diplomat was a budget label and this album is yet another re-release of early F&T material mixed in with Phillips & Burns material. I don't know why, but the piano sounds out of tune on the P&B's contributions. Surely it isn't, but the sound is different and just weird compared to the F&T stuff. 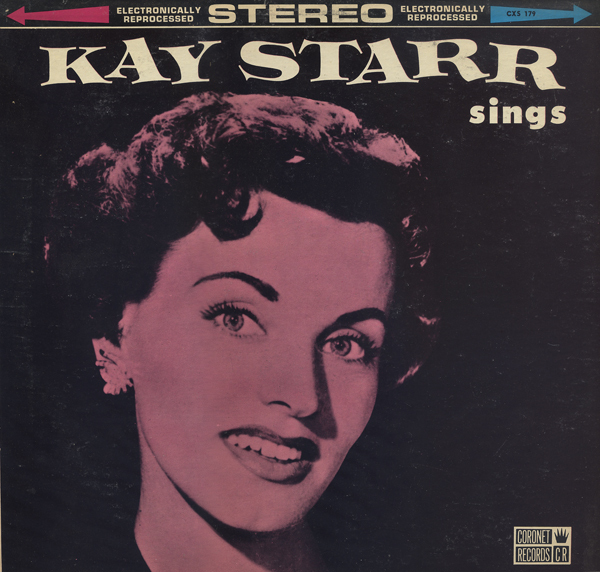 The cover model is Sandy Warner, a model Denny favored and used on his first dozen albums. 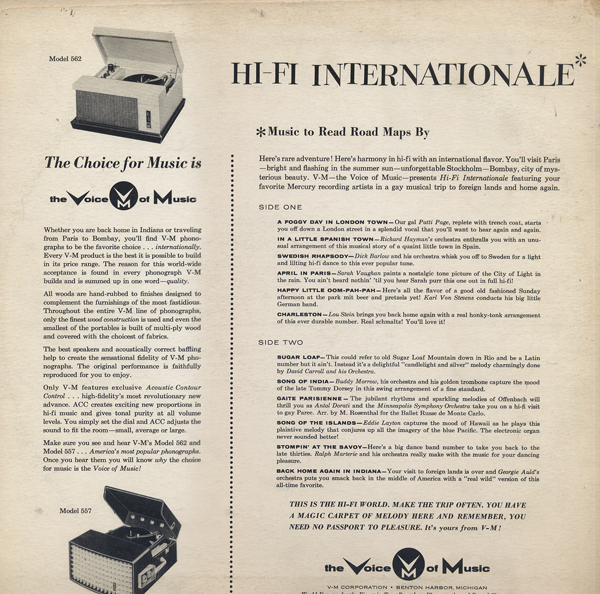 This is the stereo release. The Liberty engineering is excellent. The sound is very crisp and clear and there is something about the complexity of the sound that works well in stereo. 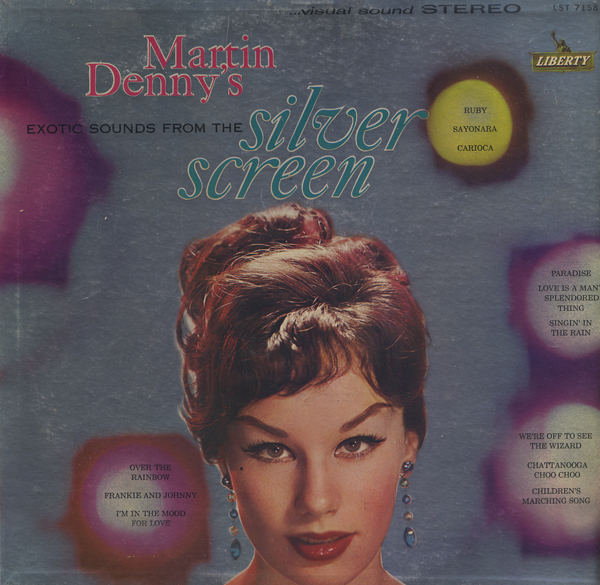 The cover is a foil paper with over printing. That means a 5 color print job. Expensive, but Denny was worth it. And lastly, there is a pure Denny cover of Over The Rainbow on the B side that is just sweet. 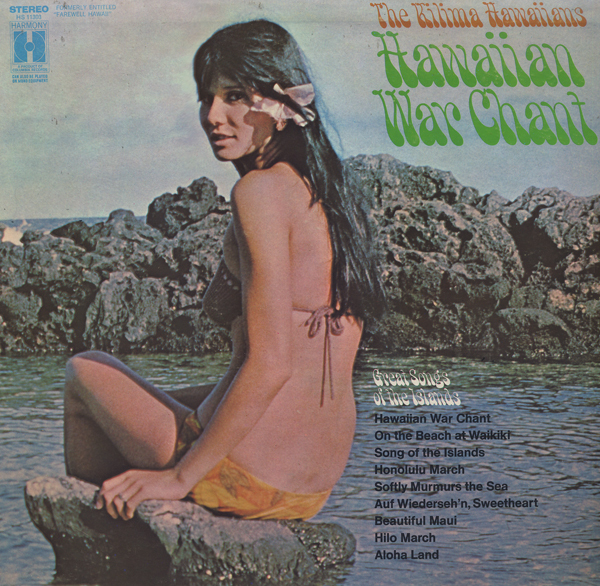 From the front cover: Formerly entitled "Farewell Hawaii". 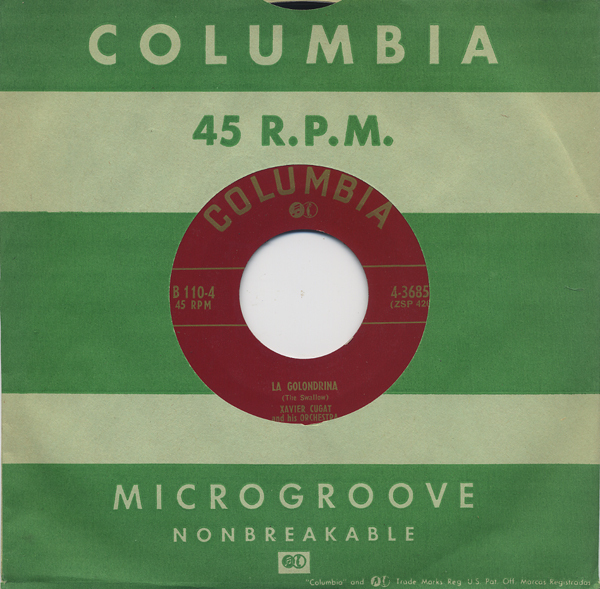 The January, 1965 issue of Billboard gave this title a "Pop Special Merit" mention. Harmony is a label that Columbia apparently acquired just before the release of this record. And for some reason decided to reissue the recording. I can't find a date for this release but it has to be mid 60s. For my tastes, this record is pretty cornball. Yes, you heard me say it... too cornball. It's more like Lawrence Welk and Benny Hill got together to make a record. Softly Murmurs The Sea is the only track that I could bare to post by way of example. 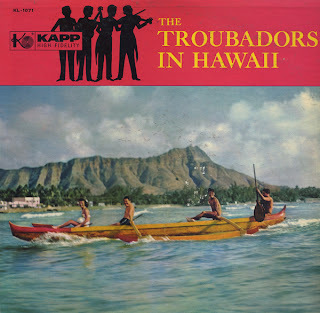 From examples of album covers displayed on the back cover, The Troubadors also visited Rome, Spain and The Land Of The Gypsies. All of the album covers feature the same layout and "branding graphic" as seen in the upper left corner. Little can be found on The Troubadors. 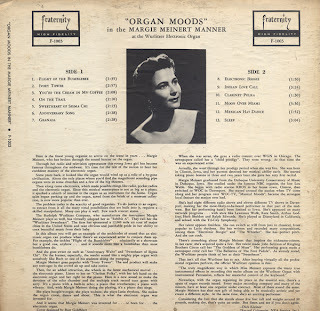 Apparently in 1957 Dave Kapp hired The Troubadors to do a song with Jane Morgan titled "Fascination". 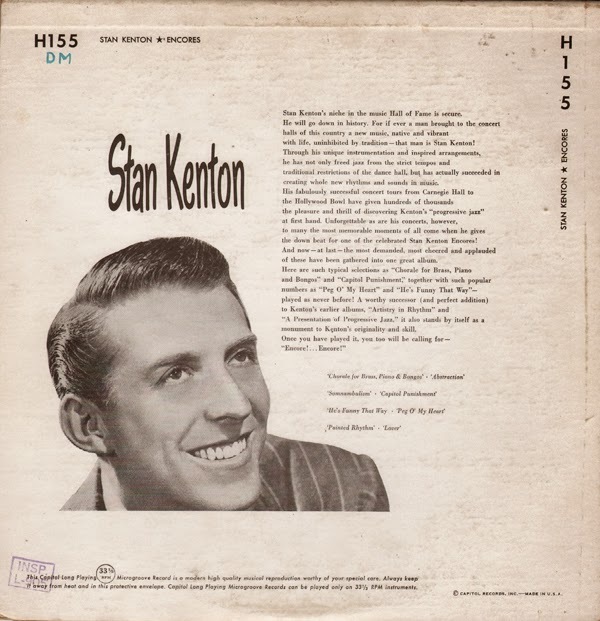 The tune became an instant sensation and remained on the charts for 29 weeks. This is straight forward mood. The sample above is a bit more energetic than the rest of the set and features an interesting "whistling" bridge. This "whistling" bridge also appears in one song found on the B side. 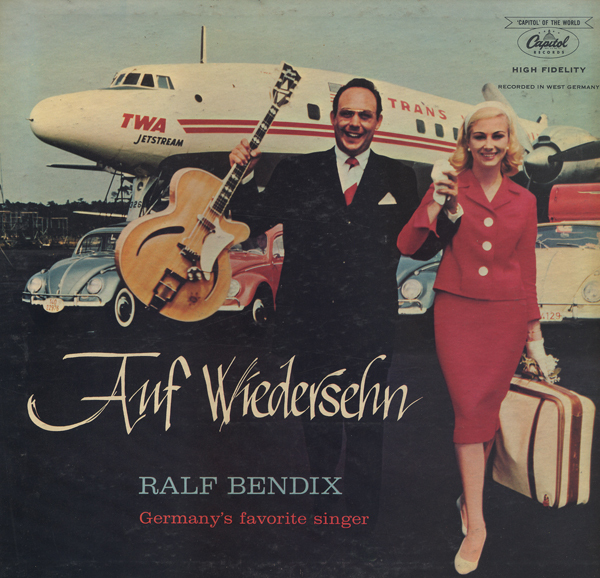 Who would have guessed that I'd stumble across an album from Germany's favorite singer? From the back cover: Germany's virile, handsome and immensely popular pop singing star, Ralf Bendix, is a story in himself. He ranks as one of the five most popular recording stars in West Germany today, yet his daily job – in the beautiful city of Dusseldorf – is manager of the Dusselfdorf office of Trans World Airlines. Further his real name is Carl H. Schwab. 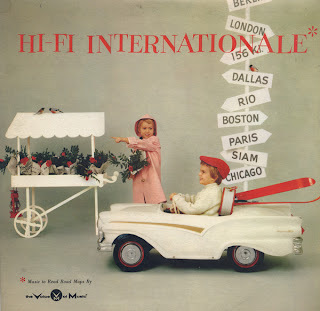 The cover photo was taken at the Dusseldorf airport and is "courtesy Trans World Airlines". An interesting side note... In the 60s Bendix got into producing other acts. Among his most successful discoveries, in 1965, was Henio. 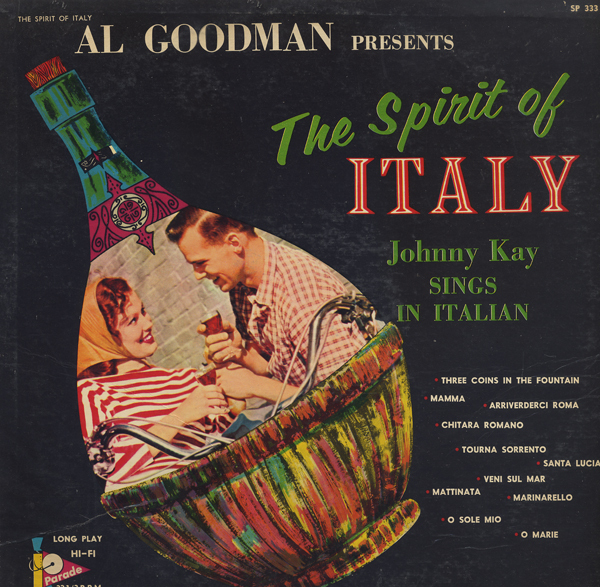 Henio, amongst U.S. vinyl collectors, is best known for the unusual art found on a number of his record jackets. 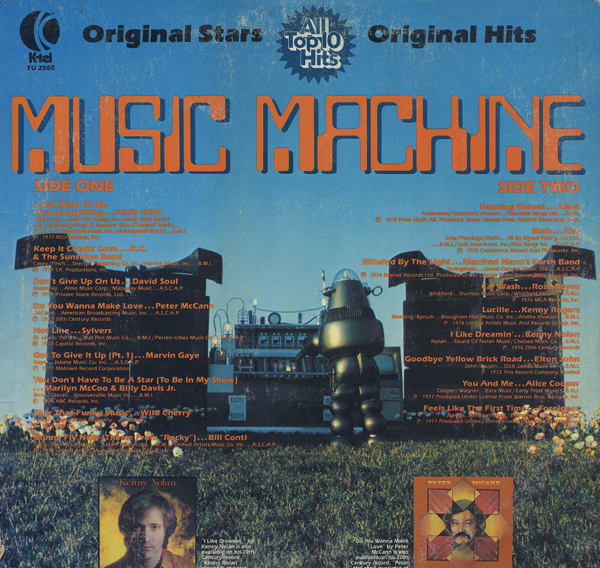 This is an obscure compilation album of Mercury recording artists whose tunes were assembled to produce this promotional tool for Voice Of Music. 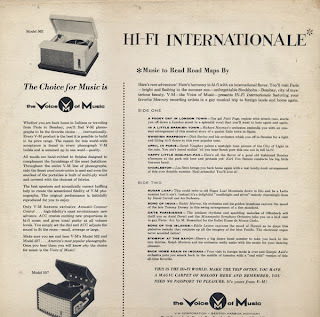 The album concept, Music To Read Road Maps By, is supported by song titles which have "destination" themes as titles. 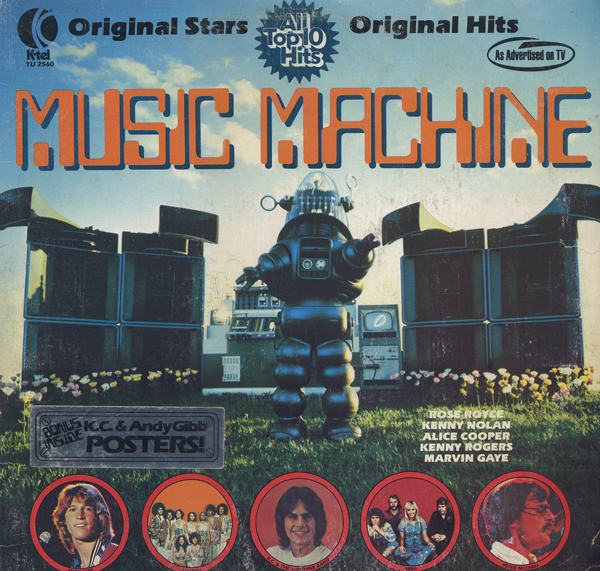 The compilation is peppy space age music, on the light side. Guest Star was big on recycling name material. 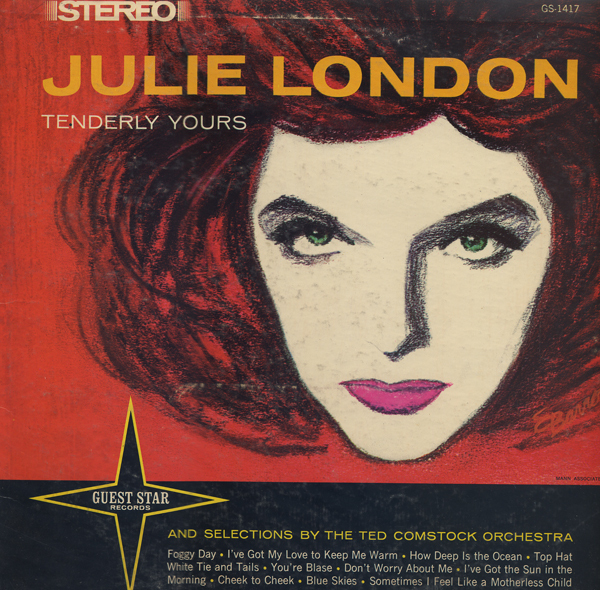 In this case, Julie London. To fill out the LP, Guest Star blended in Ted Comstock big band tracks. Both album covers shown above feature the same material and catalog number. There is a item in the October, 1962 Billboard warning dealers about this album. 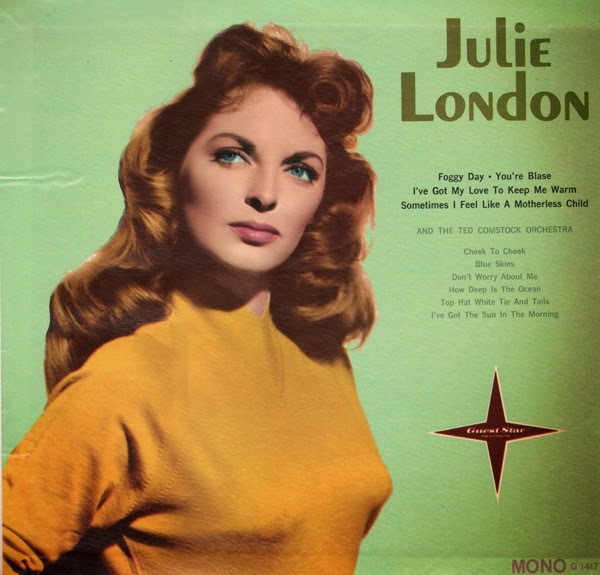 Mathematically, Julie is only 40 precent of the album, and 60 percent is made up of straight instrumentals... even though the cover gives the big play to Miss London. Her numbers are oldies and the the stereo sounds "re-processed". 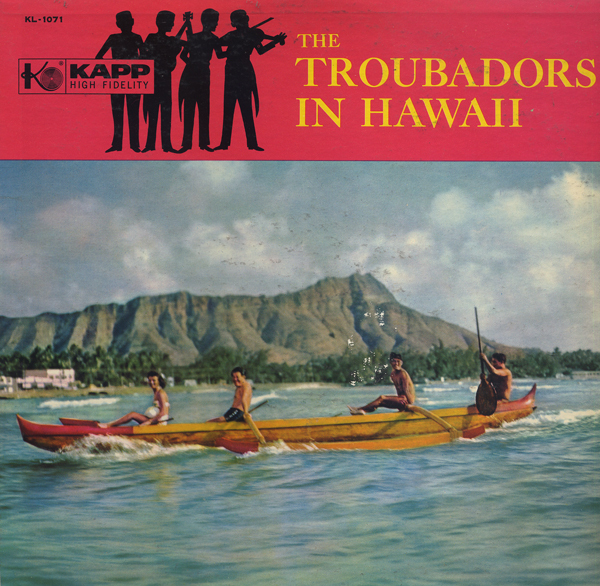 Same general talent policy is followed on other "Guest Star" albums from this label. 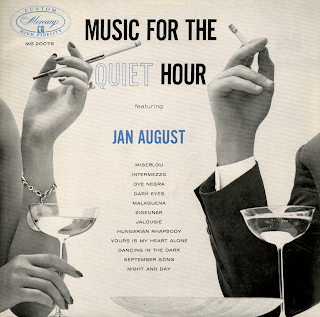 Love London's stuff, none-the-less and the cover art is nicely handled. 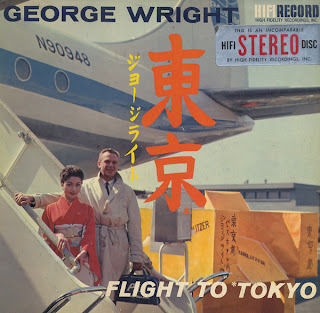 Terrific cover on this early George Wright album. Note the large yellow "Wurlitzer" packing crate. Folk interested New Jersey theatre history might take not of information to be found in the notes, written by Mort Goode. 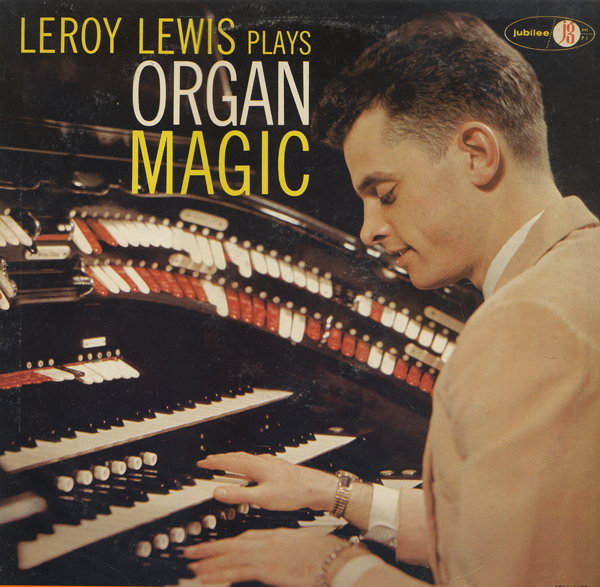 Leroy Lewis was born in Reading, Pa., May 7, 1935. When he was five he began to play the piano. He had just entered the Gerry Home For Children in Gerry, N.Y. and for the next 17 years learned, without formal musical education, the techniques of piano playing. When he was 12, Leroy and his mother moved to Porland, Ohio. For the next two years he experimented with the pipe organ in the local church, learning, by trial and error, the mechanics, the sounds and effects. When Leroy was 14 he began playing an electric organ, professionally. That was in a restaurant in Poland... Ohio, of course. The following year he was attending high school in Santa Ann, California and was the organist at the skating rink. After that Leroy was back in Pa. In Allentown he worked on the assembly line at the Allen Organ Company, played the pipe organ in the theatres in the area. For the past two years Leroy has been seen and heard in Pennsylvania and New Jersey. In 1957 he played electric organ at the Surf City Hotel. At the end of the season the hotel bought the Wurlitzer Theatre Pipe Organ in the Fabin Theatre in Hoboken. Leroy and his technical assistant, Ted Campell, disassembled the organ, moved it piece-by-piece to Surf City, spent the winter putting it back into its compact visual form.